This year marked the first that Rabeys attended the West Show at L’Eree in Guernsey to showcase a variety of commercial vehicles. A number of John Deere vehicles from the 6130R Tractor to the Gator Utility Vehicles, and Mowers where at the show for visiotrs to view as well as a collection of Fiat Professional vehicles including the Fiat Fullback, Doblo, Fiorino and Talento. The team from Rabeys hosted a large pitch at the show giving away lots of branded merchandise and competitions with great prizes as well as complimentary refreshments. 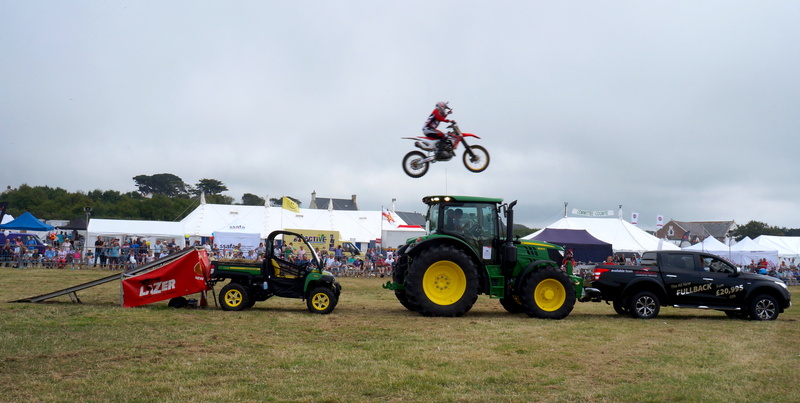 The Flyin Ryan Motorcycle Stunt team used three Rabeys vehicles to jump over; the John Deere Gator, John Deere 6130R Tractor and the Fiat Professional Fullback. The West Show takes place every year on the third week in August and is in its 103rd year.